Unlimited buffet and premium bar is included in the entry price for all Players and Spectators. All proceeds from the 2013 Charity Poker Championship will benefit One Step Programs (dba Children's Oncology Services, Inc.), a registered 501(c)(3) non-profit charitable organization dedicated to improving the quality of life for children and adolescents diagnosed with cancer. 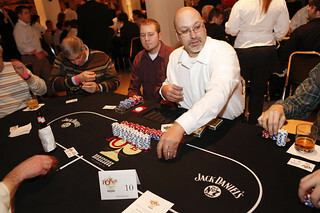 More information on our programs and the 2013 Charity Poker Championship can be found at www.onestepcamp.org. Self-parking is available within 400 feet of the River East Arts Center (at 490 E. Illinois Street and also 511 E. Grand Avenue). Tournament begins at 6:00pm. All players should be registered and seated by 5:45 pm. Check-in/Registration, Bar and Buffet opens at 4:30pm. Remember, entry is limited to the first 300 players who register. $275 for players and $75 for spectators. Unlimited buffet and premium bar is included.